This image is the result of numerical processing of 22 images taken by Miloslav Druckmüller and 8 images taken by Peter Aniol. 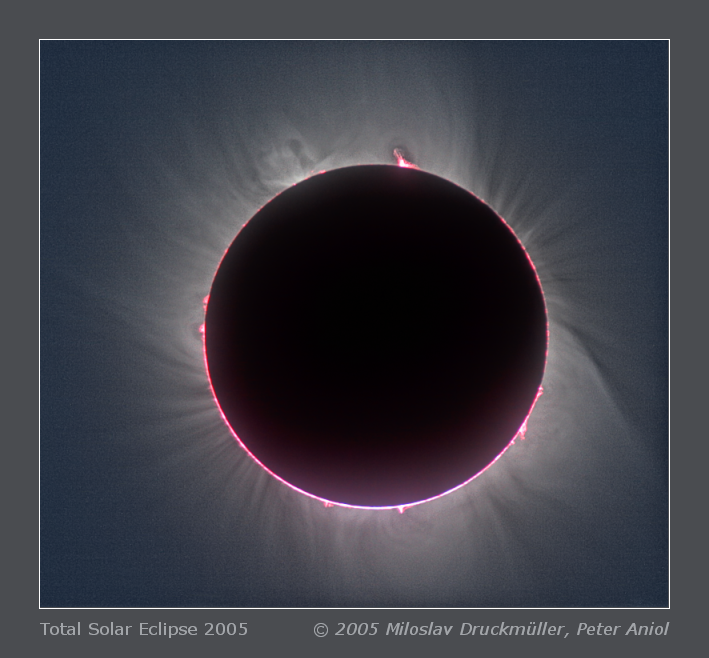 The inner part of the corona was reconstructed mainly from images taken by Peter because he used longer focal length (600 mm) and the digital camera with chip having smaller sensors (Canon EOS 20D). The more distant part of the corona was reconstructed mainly using images taken by Miloslav, who used shorter focal length (400 mm) and camera with bigger sensors (Canon EOS 1D Mark II), which have lower noise. The red fog is H-alpha radiation of the solar chromosphere diffused by a cirrus cloud.